Model Maker is a utility program that forms part of the process developed by James Mindham, to convert standard FS aircraft models into low resolution model sets, that can be used by either Squawkbox or FSInn. In simple terms, the process enables you to see the correct aircraft model, rather than the infamous default Squawkbox paper dart or FSInn Learjet. James spent some time ploughing through various FS freeware sites and downloaded aircraft that he thought suitable as online models, and pre-configured these aircraft models making them ready for use. They are grouped together in two sets named VUK and CXD. The CXD set contains the 2-4-CIX display aircraft models. As well as doing the conversion, Model Maker creates the relevant FSInn cfg files, and automatically configures the correct codes for the FSInn Default and Custom databases thus avoiding the need for manual configuration via Inn Plane. Both Squawkbox and FSInn can draw on the same converted models. The converted models are contained in separate folders within the FS9 Aircraft folder or the FSX SimObjects/Airplanes folder, grouped together in folders named VUK and CXD. He has outlined the process below, allowing you to add your own additional models if you wish to do so, before running the conversion program. How do I use Model Maker? Follow the steps below - once you are familiar with the process, it will only take a matter of minutes before you see a desired model online. Create a new folder to store the aircraft you would like to use as online models. This folder can be located anywhere on your computer. The suggested folder name is 'Online Models'. Download the VUK Base and the CXD Base model sets and unzip them into your folder, they have been configured already for Model Maker. Skip this section if you do not wish to add any other models. Aircraft created for earlier versions of Flight Simulator provide excellent online models as their polygon count is low and they have lower texture file sizes. Those with a smaller .mdl file size will perform better. 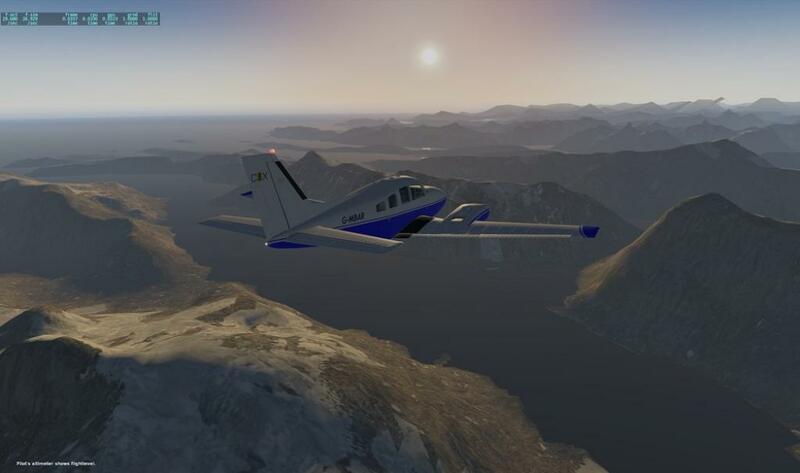 So, for example, I have downloaded a freeware Beech Duke (for FS2000) and Piper Cub (for FS2000) from simviation.com. I have unzipped and copied them to my ‘Online Models’ folder. I have also deleted the sounds, panel and unnecessary texture folders, I could even reduce the size of the textures using a paint program to help frame rates. FSX will not recognise aircraft models that were written as a windows dll library, only MDL8, MDL9, and MDLX models will show. You can check this by opening the .mdl file of your downloaded aircraft in notepad - most of the file will be unreadable, but look to see if there is a MDL8, MDL9, or MDLX header. If you see ‘This program cannot be run in DOS mode’, then this is a dll based model. To be absolutely sure that your models will show, you should use models created for FS2004 or FSX. Do not save the file from Notepad. My downloaded Duke and Cub folders are currently called ‘cdduke’ and ‘Yellow Cub’, I need to rename these folders accordingly. Every model set must have a 3 letter identifier, so I am going to call my model set ‘JMI’, therefore the aircraft folder names will begin with 'JMI'. An underscore must follow the 3 letter identifier, and the underscore followed by whatever you want to call your aircraft, for example, I tend to use the ICAO codes for the aircraft, so I would rename my folders ‘JMI_BE60’ and ‘JMI_J2’. This step is vital in order for Model Maker to extract the correct information about the aircraft. Model Maker requires the title, model ,texture, sound, icao, type and variation lines in the aircraft.cfg file, it will ignore everything else. Model Maker can account for different liveries, but this example illustrates how to alter the aircraft.cfg to show a default Beech Duke, if the aircraft.cfg has more than one [fltsim] entry, you must delete all apart from [fltsim:0]. TIP: Use the equipment.txt found in the Squawkbox folder to find the correct ICAO code, if no ICAO exists for any aircraft, then we will need to create one for universal use. Once you have renamed and configured everything following the steps above, you can run Model Maker. On the first run, Model Maker will ask you to locate your online models folder, the FS Aircraft/Airplanes folder and Squawkbox folder (if required). You can reset these by clicking on the ‘Reset Folders’ button. Once the folders have been set, click on the ‘Process Models’ button. This will initially parse all the aircraft.cfg files and search for errors. Once it is happy, it will write the appropriate files. Model Maker installs a much reduced equipment list for Squawkbox which means that one aircraft type is used for one ICAO code, this will help with any confusion when presented with a multitude of variations for a single aircraft. You may need to use the 'complete list' to find your aircraft type and any fictional ICAO codes needed will be displayed under ‘FICTIONAL’ . Backups are made of your existing equipment.txt and fictional.txt.